Milliken Research Associates, Inc. -- "Race Car Vehicle Dynamics: Problems, Answers and Experiments"
Race Car Vehicle Dynamics: Problems, Answers and Experiments (PAE) contains 300 pages of problems, worked solutions and vehicle dynamics experiments. It is a companion book to Race Car Vehicle Dynamics, and it replaces the Race Car Vehicle Dynamics Workbook (which has been discontinued). Structured as a series of questions related to each chapter of "Race Car Vehicle Dynamics", PAE guides readers toward a better understanding of vehicle dynamics through hands-on calculations and experimentation. 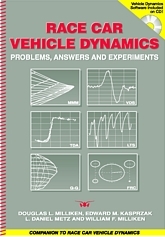 Problems from the original Workbook have been supplemented with a large number of new problems developed in conjunction with college-level vehicle dynamics courses. All problems have detailed, worked solutions. PAE bridges the gap when using RCVD as a textbook, and is a valuable asset to anyone interested in a better understanding of vehicle dynamics. An appendix of sample course outlines, suggested background knowledge, a discussion of how to learn vehicle dynamics (when starting with a variety of backgrounds) and a supplemental list of useful references is provided. Numerous open ended problems are included, such as suggestions for experiments which can be done with one's own passenger car. The accompanying CD contains the RCVD Program Suite, a collection of simple vehicle dynamics programs which correspond to the material presented in RCVD. These programs have their own set of problems and readily lend themselves to experimentation by the reader.